Whether a newcomer adjusting from the resort or a seasoned expert looking for work-horse shoes for 100+ backcountry days a season, the Tour Pro is a top of the line contender. We tested long and hard, comparing to dozens of boots. We really tried to find a weakness with this product. In the end, it is easy to call the Tecnica Zero G Tour Pro the best AT ski boot in our test. Our test is likely comprehensive enough to call this the best AT ski boot on the market. Others might ski downhill a little better, others certainly go uphill better, and others have unique attributes that promise to refine into excellent offerings. However, for now, we can't recommend a better pair of ski boots for the center of the backcountry skiing bell curve. The weight is right, the downhill skiing is smooth and supportive, and the overall form factor is familiar and proven. The closest competitor is the contemporary Dynafit Hoji Pro Tour. They even share naming convention. The Hoji skis a little better, but the Tecnica is lighter, tours better, and comes together without some overly-innovative quirks that compromise performance. After an initial effort at backcountry boots that kind of fell flat, Tecnica really stepped it up for 2018-19 with the Zero G Tour Pro. On one level this boot "looks" just like other efforts from major boot manufacturers; take your typical resort all-mountain ski boot and slap a walk mode and tech fittings in it. Atomic, Lange (and Tecnica, before this year) and others have appeared to follow this formula. The results have been varied. We have really enjoyed skiing these modified overlap boots, downhill. All, though, suffered on the uphill. Tecnica, for this year, really stepped up the game and is offering a boot that will have very wide appeal. It strikes the ski-to-tour performance balance as well as anything on the market, at a weight that is virtually unbelievable. Overlap boots of just a couple years ago worked hard to get down to 7.5 pounds. The Zero G Tour Pro is exactly 6 pounds. For what its worth, five years ago the Best Buy La Sportiva Spectre was the "world's lightest 4 buckle ski touring boot" at 6 lbs 4 oz. The Spectre skis about like an average touring boot of that time period. The Tecnica Editors Choice destroys convention with downhill performance that could be said to double that of the La Sportiva and shaves further ounces. That Tecnica does this in a boot that "looks" normal (overlap construction, four buckles, power strap, external rear walk mode) is unheard of. It might sound shallow to comment on how the boot "looks". However, familiarity goes a long ways toward a skier's comfort and performance. The Tecnica Zero G Tour Pro is familiar to life-long skiers. We like that. Read on for our expanded thoughts on this significant piece of equipment. Our Editors Choice winner is the one that tops the charts. We work hard to make sure that our scoring rubric reflects real-world use and that the boots that score the highest are also the ones that we just like the best. In this case, the Tecnica does all that and more. The overall score is quite a bit higher than the next competitor. More significantly, our lead tester barely wants to ski anything else. The Tecnica Zero G Tour Pro came to us relatively early in the season, with other tested ski boots trickling in over days and weeks. When we test we first use the boots "straight out of the box". Jed set up the Tecnica for his daily guiding skis and went at it. He was immediately stoked on them. Usually we might use a pair of boots for a few days, draw some conclusions, and want to move on to the next (or to have some work done on the boots for better comfort and performance). The Zero G Tour Pro nails the ski touring and ski mountaineering sweet spot (as well as perfectly fitting our lead tester's very average feet) so well that we had to really light a fire under the lead tester to get him in the other tested boots. The good news is that, in 2019, AT ski boots are so good that we don't really step down too far from the Zero G Tour Pro. Backcountry skiing takes on many different flavors. Here, skiing the Nugget Couloir in Grand Teton National Park. The Tecnica is up to the challenge, with capacity to spare. The bulk of your backcountry skiing day goes against gravity. To do so, efficiently, you need low weight and effortless ankle mobility. We assess weight independently (below) and comment here on ankle mobility. We assess both absolute range of motion and friction within that range of motion. We make (or used to make…) some generalizations about boot construction and uphill performance; "Overlap" (or "two-piece") ski boots go down better and uphill more poorly than "tongue" (or "three-piece") boots. Up until this year our generalizations were largely fair to make. Recent additions mix this all up. The Zero G is the best touring overlap boot we have ever used. The range of motion is more than most ankles and the friction is low enough to drive a stick shift wearing them. These tour better than all but the most uphill-focused boots in our review. They have greater ankle movement than perennial "classic" favorites like the La Sportiva Spectre and the Scarpa Maestrale RS. To compare them to other overlap boots is ridiculous. Previous Tecnica boots and the Top Pick Lange XT Freetour are as different from the Tour Pro as wingtips are from sandals. 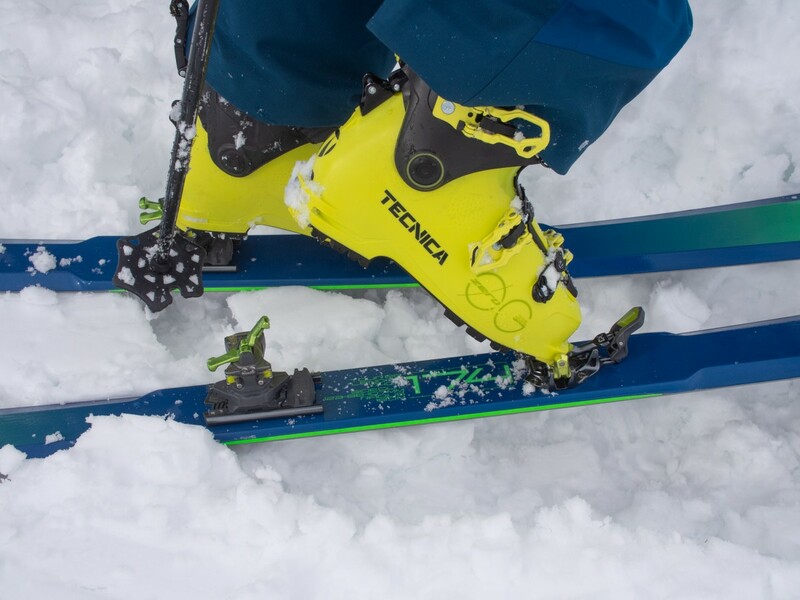 The Tecnica Tour Pro is in the "sandal" class of ski boots with the uphill monsters like the Editors Choice Dynafit TLT7 and the Top Pick Scarpa Alien RS. The Tecnica's might be sturdy river sandals while the Alien are drug store flip flops and our analogies might be stretched thin, but you get the point. The cuff mobility of the Tecnica is impressive. For high energy and low angle skinning, they'll stay right out of your way. Again, these boots would have been the lightest "performance" ski boots on the market just a few years ago. Six pounds is totally reasonable to lug around on the most severe of ski mountaineering endeavors. You can go lighter, of course. However, go any lighter and downhill performance takes a huge leap down. On the other hand, you can go quite a bit heavier than the Tour Pro and not yet gain better downhill performance. Around six pounds is the retinue of solidly "all around" backcountry ski boots. This is roughly the same as the Dynafit Hoji Pro Tour, the Scarpa Maestrale RS, and the Best Buy La Sportiva Spectre 2.0. With these other boots, though, you get either finicky use or poorer downhill ski performance. Just because we go on and on about the performance to weight ratio of the Zero G Tour Pro, don't overlook the efficiency gains of going even lighter. For the most physically demanding missions you can drop a pound off each foot with the Top Pick Scarpa Alien RS. Downhill style will change, but uphill efficiency will increase even further. Long, powdery sessions of trail breaking are definitely easier in light and flexible boots. The Tecnica fits the bill and then locks down for high-speed downhill skiing. We go backcountry skiing for the down. We all want something different from our downhill experience, though. 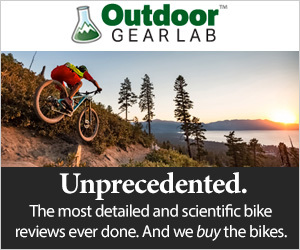 If you ever want high speed or high stability on your downhill legs, don't settle for performance less than what is offered by the Zero G Tour Pro. The performance is tuned to be just stiff enough to drive big skis, real fast. The lateral flex is solid and the forward flex is progressive and smooth. As compared to heavier boots, the rearward flex of the Tecnica is certainly less. Ski centered and balanced and this shouldn't be an issue. Get sloppy and in the back seat and the Tecnica will lightly punish you for the indiscretion. Otherwise, they ski exceptionally well. At this weight no boots ski downhill better. Tack on a few ounces for the Dynafit Hoji Pro Tour and you get real, noticeable, but small improvement in downhill performance. The "Hoji Lock" system at the cuff seals things up tighter than any other touring boot system on the market. This bump in performance is real but not huge. Some might not notice it at all. And it comes at the cost of weight and some fiddle factor. To do better than the Hoji and Tecnica boots you need to tack on at least a half pound a foot. The Atomic Hawx Ultra XTD 120 skis a little smoother, while the Top Pick Lange XT Freetour 130 almost replicates resort all mountain boot performance. Steamy boots coming off the feet of our lead test editor IFMGA mountain guide Jed Porter. This day he guided Wyoming's classic "Apocalypse Couloir". We are able to get multiple feet into these boots, making direct comparisons of unaltered AT ski footwear. As compared to our entire spectrum of tested boots, we have to say that the Tecnica Zero G Tour Pro is exactly average in fit. It sits squarely in the middle. The liner is about average too. Others have foam that is softer (offering greater initial "shelf appeal" but compromised durability and fewer long-term fit options) while others are stiffer (all around better). Fit is so subjective. For most, a comfortable fit requires the assistance of a professional. Aside from the above rough generalizations, we hesitate to offer comparisons and suggestions. Try things on and know that excellent boot fitters can work near miracles. 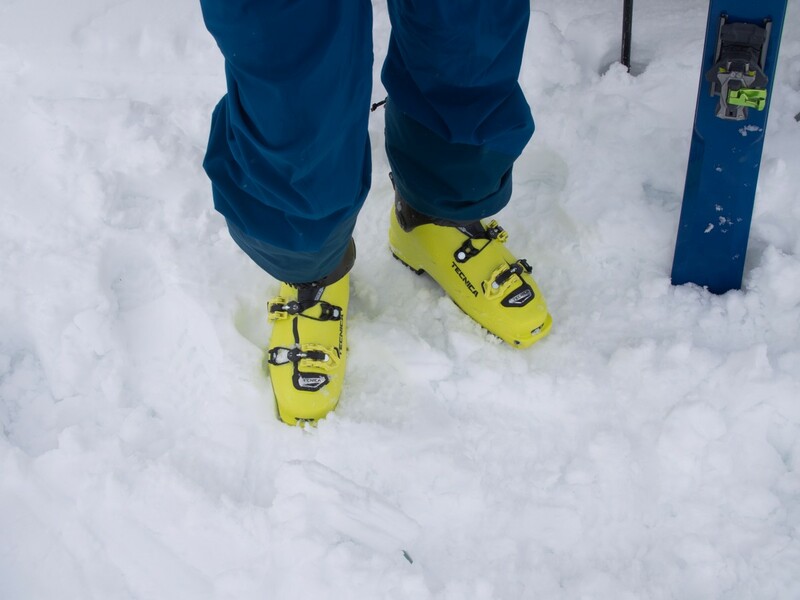 The lucky skier is one that can ski his or her boots "right out of the box". The large external rear cuff lock lever works reliably. It is a bit more complicated than most, joining the cuff to lower shell in two different places. It works. Backcountry skiing takes place in cold settings and environments. That so few reviews comment on insulation of ski boots is peculiar. In our testing, we have found that there is a wide range of insulation value in ski boots. As boots get more and more specialized and lighter, insulation value changes even more. To accomplish all the great things enumerated above, Tecnica has slimmed down the plastic and the liner material of the Zero G Tour Pro. The result is lowered insulation value. These are among the less insulating boots in our test. If you have chronically cold feet or ski in particularly cold climates, proceed cautiously. The Tecnica can be pressed into expedition or super cold use with careful fitting and intentional accessorizing. They will never be as warm as something thicker like the Atomic Hawx Ultra XTD or the Scarpa Maestrale RS. The Tecnica's insulate about like the Salomon Mountain Lab and the Best Buy La Sportiva Spectre 2.0. They are noticeably warmer than the ultralight Editors Choice Dynafit TLT7 Performance and the Top Pick Scarpa Alien RS. The Tecnica Zero G boots don't insulate quite as well as heavier boots do. Keep moving and you'll be ok even in sub zero temps. In use, the Zero G Tour Pro uses a proven formula. The four buckles, power strap, and rear, external ski/walk mode are simple, familiar and reliable. You have to make 4 moves at every transition, but this is the case for almost all average to high-performance AT ski boots. The ski/walk mode locks securely, even when moderately iced up. All overlap boots are tougher to get in and out of than tongue boots. The closest comparison, in terms of overall performance, is to the Dynafit Hoji Pro Tour. The Hoji and the Tecnica are close in weight, tour similarly, and ski down pretty close together. The Hoji edges ahead in terms of downhill skiing but the Tecnica takes the usability prize. The Tecnica is reliable and familiar. The Hoji employs all sorts of innovative and experimental usability attributes. Some of the Hoji attributes don't matter (like the "one move" transition attribute; if you want true uphill efficiency you need to make three to four moves, just like everyone else) while others are significantly limiting. That you can use regular automatic crampons with the Tecnica (you can't with the Hoji boot) might be all you need to make your choice between these two. The power strap of the Tecnica boots is a little different than "normal". It saves weight and doesn't leave velcro exposed to catch on the inside of your pants. We heartily recommend these boots for day-to-day backcountry skiing and ski mountaineering. For rowdier missions, they will hang tight as well. They are light enough for 8000 vertical feet of human-powered skiing and support well enough to back up pro skiers in photo-shoot style riding. A sampling of our recently tested ski boots. The Editors Choice Tecnica sits on the left, looking largely "normal". There was a time not that many years ago when top of the line AT ski boots edged over $1000. We are thankful that that time is past. 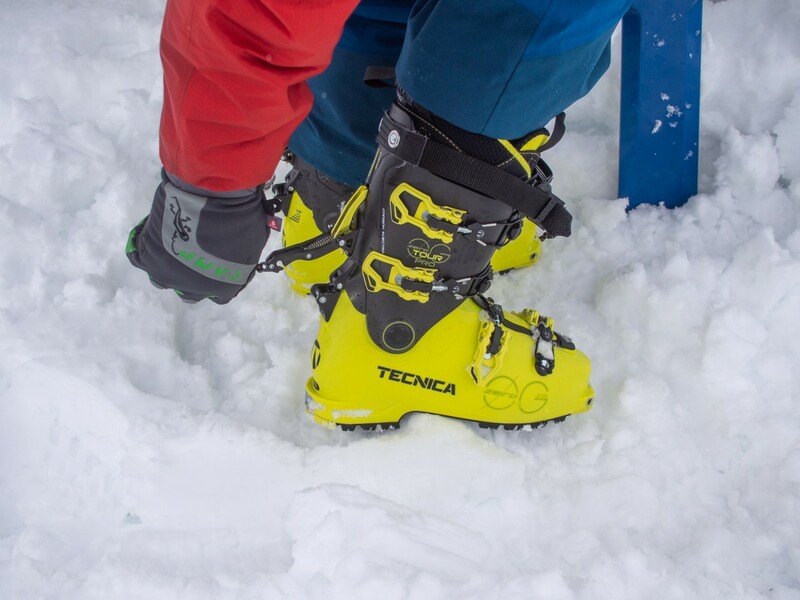 The Tecnica Zero G Tour Pro isn't inexpensive, but they are in line with trends that have brought the upper limit of AT ski boot prices down. High, cold, and wild in Western Wyoming. The Tecnica was just warm enough to stave off frostbite this day. Temps stayed well below zero fahrenheit, the sun barely peeked out, and the wind blew strong. We might have been able to slap on this Editors Choice award badge within hours of first unboxing the Tecnica Zero G Tour Pro. However, we didn't jump to that conclusion. As favorable as the first impressions were, we made sure to do our due diligence. We skied the steeps, the deeps, and the crappy. We got the boots on a handful of testers and collected diverse opinions. We even did some rock climbing in them. The end result is an authoritative and hearty five-star review of a product that quietly sneaks into the market and makes a big splash.